General Characteristics: Medium in height, erect, moderately stocky, maturing within 7 to 12 months, producing two or three branches; distinguished by the yellow corm flesh and heavy reddish-brown flecking on the lower portion of the petiole. Petiole: 60 to 90 cm. long, pale green prominently flecked with reddish-brown to purplish on the lower portion, with fairly distinct broad pinkish edge, pale pink at base with white ring. Leaf blade: 20 to 50 cm. long, 20 to 30 cm. wide, 20 to 40 cm. from tip to base of sinus, sagittate, chartaceous, dark green or with bluish cast; piko yellowish to reddish; lobes acute with deep sinus. Corm: Flesh yellow with yellowish fibers; skin cream-colored, occasionally purple along leaf-scar rings. 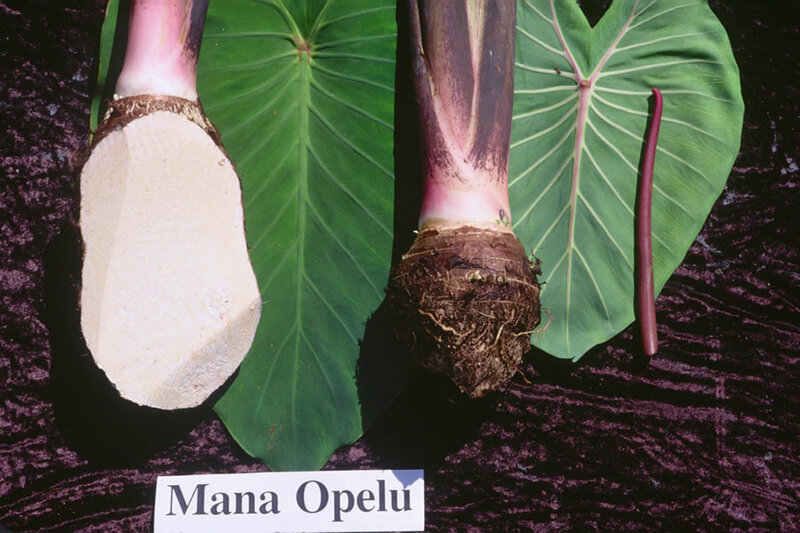 Origin, and derivation of name: Native variety; named after the fish, opelu, because the Hawaiians used the corms as bait. Distribution: Planted in a few scattered localities on Hawaii and Maui, nearly always under upland culture. Remarks: According to the old Hawaiians, the fish bait was prepared by cooking and pounding the taro until it could be broken in small pieces. The pounded taro was placed in a small net bag and lowered into the water directly above a large net, previously laid. The taro was released from the bag by a sudden jerk of a cord, and as soon as the school of opelu was within the large net, the net was hoisted to the surface.